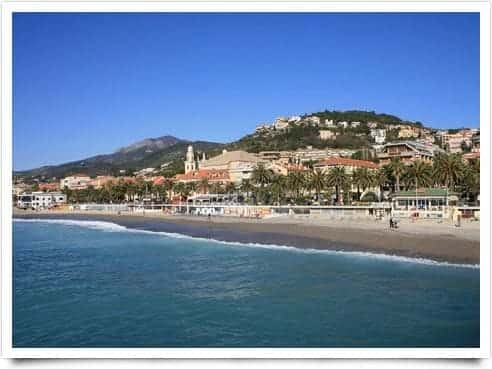 Pietra Ligure is a partially mountainous coastal municipality of 8.935 inhabitants, located at 3 meters above sea level Province of Savona, Its territory covers an area of ​​9,70 sq. km. "Castrum Petrae" was the castle built by the Byzantines on a large rock, a defense against the Lombards. Developed by lines parallel to the coast, the village belonged to the bishops of Albenga and then to Genoa. How to Pietra Ligure Roman villa dating back to the first century BC, but there are traces dating from the Neolithic to the coast and a settlement of pre-Roman courts in the region, to Giustenice. Near the castle is the fifteenth century Loyal Franchelli. The parish church of St. Nicholas dates from the eighteenth century: the vault is frescoed by Antonio Novaro, while St. Nicholas in the chair in the apse is by Giovanni Barbagelata. Are dedicated to the patron saint celebrated a procession and a festival. The other parish of Our Lady of Salvation, was built between 1595 1608 and, while in the old town is the Church of the Annunciation, of the seventeenth century. Stone is a seaside resort and tourist area with hotels and attractions to suit all budgets and all tastes. In addition to the plants in the sand on the beaches (summer opened a surf school, diving to the seabed) are a sports hall, gymnasium and tennis courts and football pitches, numerous swimming pools. Penetrating into the interior of the valley is a must Maremola a trip to the ancient Ranzi divided into three districts. It was built around the chapel of San Sebastiano, built around the year one thousand by the Benedictines of St. Peter in Varatella. For the Corpus Christi prepares the "Star of Ranzi", a stunning floral display in the shape of a star. Upon leaving the village and going inward through the wide cork of "Ciazze dry", a protected area. Still climbing, to the country church of San Martino, you meet the old boxes of shepherds among which the "cabanun", built in single stone without mortar. At the refuge floor of Bosse crosses the Alta Via of the Ligurian Mountains. A Pietra Ligure were born Nicholas Accame, poet and patriot Giuseppe Mazzini's friend and the author of the partisan, and Christopher Accame, famous winemaker and very popular character among pietresi. Want to contribute to the completion of this page dedicated to the town of Pietra Ligure?